Over the years I tried different tools from dentist’s tools to carved wooden brush handles for applying textured gloop to bases. This experimentation led me to the conclusion that you need something pointed, flat, and capable of holding enough basing gloop for the job. While in an art shop buying a palette knife for a friend I had an epiphany. Spreading gloop on bases is like spreading mortar. Therefore a palette knife shaped like a mason’s trowel should be the ideal tool, and it is indeed! I recommend trying one if you haven’t already. The other tool is a brush for brushing gloop into small gaps – and washing gloop off figures where I have spilt it! Putting a basic texture on a figure’s base can be done in two ways. One is to cover the base in PVA and dip in sand and then paint it. I prefer the alternative approach of using textured paint to cover and paint the base in one go. I make my own textured paint for basing and have put the recipe on a separate page. 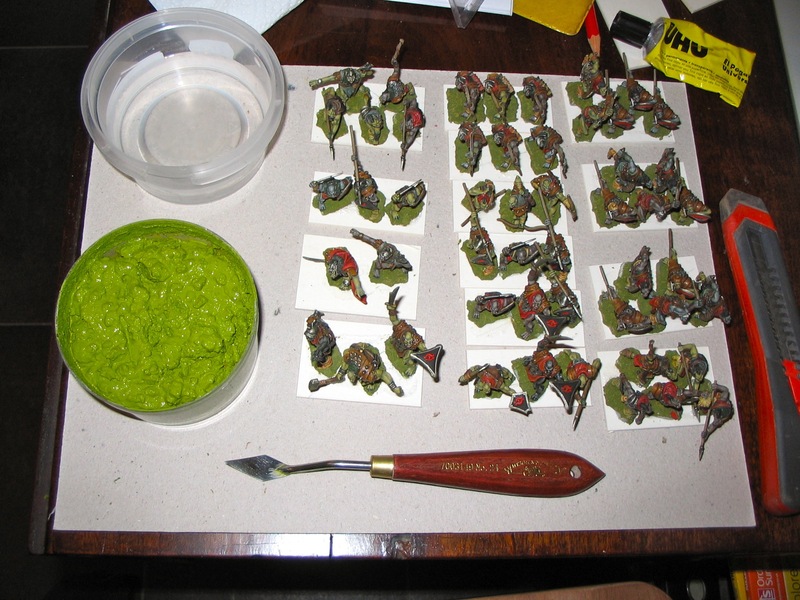 There are commercial products you can buy but I enjoy the DIY approach – a bit like wargaming meets cooking. If you wish to buy ready made ground texture I recommend Basetex. I used it for years and in terms of texture and sensible colours I have not found anything to beat it. Once the glue has dried and your figures are secure on their bases put on the gloop and paint any edges. Then leave to dry for some time – overnight usually does it. Once everything is dry I give the textured surface a quick drybrush with a lighter colour. For standard green temperate bases I drybrush with a light yellow ochre artist’s acrylic. Then I mix PVA glue and the paint I used as the base for the gloop 50:50. I then spodge this on clear areas with an old brush and while it is thick and wet press any scenics I am using into it. I use gaming and model railway scenics according to what looks ok and is on special offer! Again let it all dry and blow (a photographer’s rocket blower is good but use it outside) or dust with a brush to get any flock or debris off the figures. Then give a final coat of spray varnish in a well ventilated area. This fixes the scenics in place and protects the base paint work too. If you are using a spray matt varnish make sure you shake it well; it is not cold; use it on a dry day; don’t pick up a can of undercoat by mistake. This may sound neurotic but temperature and humidity can affect matt varnish. Unintentionally spraying everything you just finished with undercoat is bad anytime! Before you start making bases check the rules and army list. Then you should be able to work out how many bases and of what size are needed. 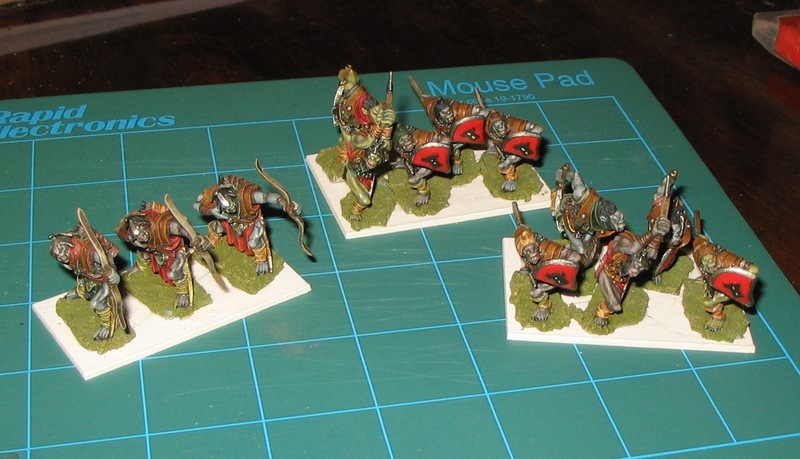 Sometimes I use ready made plastic bases but the bulk of my painted figures are based on card. I use thin mounting card from art shops as I find it sturdy enough once figures and ground material is added, and it avoids the figures looking like they are mounted on a paving slab! I know thick (2mm or more) bases are robust but I feel a smoother join with the table top looks better. So what else do I use? I use a set square and pencil for marking out the base outlines on the card. 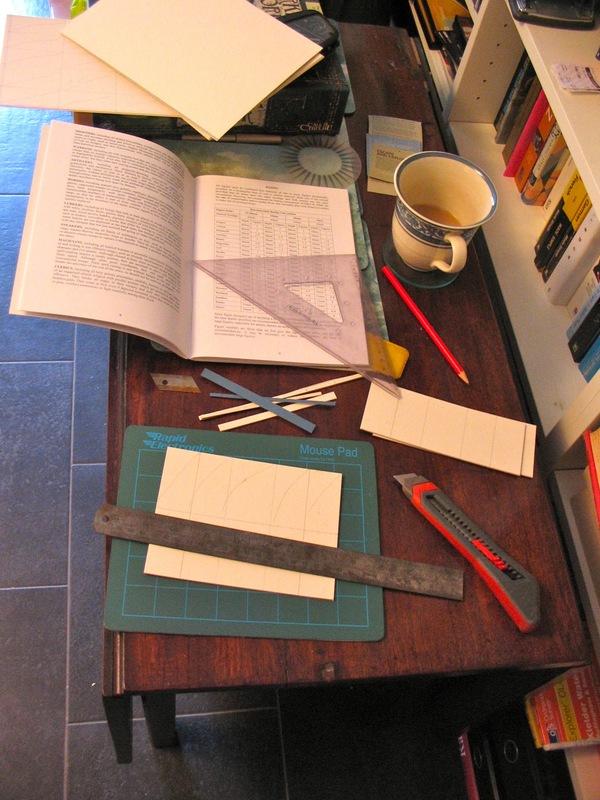 Then I use a steel ruler as a guide and cut the card with a heavy duty craft knife. Two key points are: a new blade in the knife and several gentle cuts. Oh, and a self-healing cutting mat so I don’t have to French polish the table afterwards. Once the bases are cut out and any wounds dressed it’s time to stick the figures on. Yes, knifes are sharp and the best way to avoid cuts is a series of cuts rather than forcing the blade through the card. Then get gluing and I use a standard contact glue – Uhu is my favourite. PVA is just as good and really it’s using something you are happy with. I regard super glue and epoxy as overkill for card. 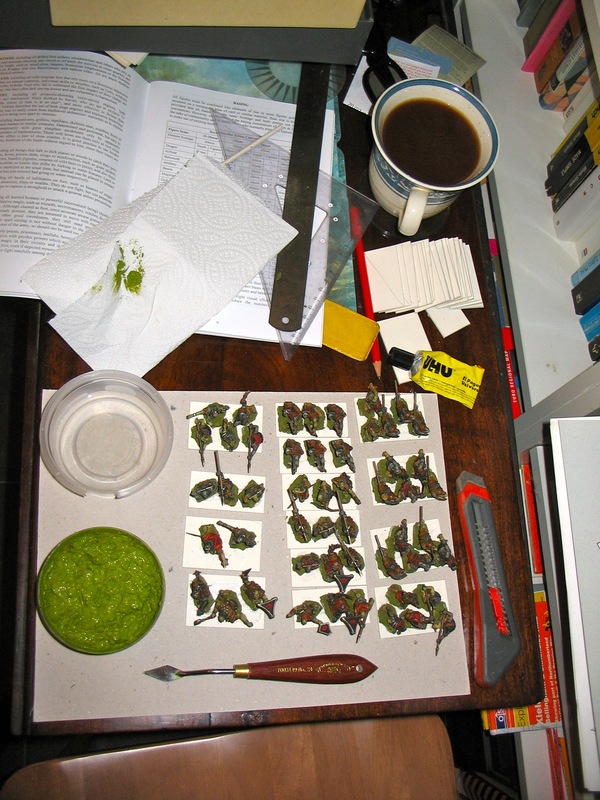 Yep, it’s time to base some Mithril Miniatures orcs for Hordes of the Things. I had these based for Warhammer but now have enough suitable figures to retire these. The idea is to use these for HoTT Middle Earth forces.